This is my first official blog and am sure there will be many many more to come:) I signed up to start blogging a couple of months ago, thank you to my wonderful neighbour Lolly for helping me:) but the rollercoaster of life hasn’t allowed me to start until now! So where do I start?? 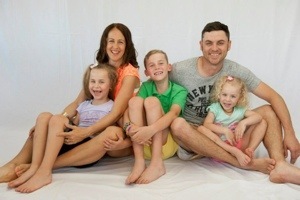 My name is Natalie Trew (previously Winters) I am 32 years old and a wife to a wonderful husband Kane and a mummy to 3 beautiful angels….Bailey 6, Sienna almost 4 and Mia who just turned 1! The most important role of my life as it stands, is being a mum….no other job could ever compare! My background info: I was born into a magnificent family with two loving parents Gary and Carol and twin sisters, six years older than I, Michelle and Peta. We had a great up bringing. Mum and dad always worked so hard to provide us with what we needed and we will always be indebted to them. I did my primary schooling at Woodridge North and my high schooling at Woodridge High where I was school captain in year 12. We have always been a very sports orientated family as the girls and I mostly played netball. I was lucky enough to represent the state for netball in year 7 and continued to play rep and state league right up to the age of 19. When I finished grade 12 I got into university and studied primary school teaching…..I have currently been teaching for 10 years. My life now as it stands is truly magical! I have been so blessed with so much (plenty of ups and downs) I feel like I am a very lucky lady! My husband and I have been together since we were 17, 15 years this year! We have created a wonderful life together. We bought our first house 10 years ago, which we currently live in, an investment property, cars, enjoyed many holidays together, especially our trip to USA 2 years ago. But the best thing we have done together is becoming parents and creating our 3 little treasures, who we love and adore more than life itself!!! (Seriously my heart aches every time I think of them)!!! My starsign is Aries so obviously I can be fiery, Id rather call it passionate…lol! I love to be creative and enjoy craft work in the form of scrapbooking and decorating. I am a neat freak, ok maybe a little bit OCD but I have calmed down since having the kids:) I love shopping and am a fashion queen – in every way!!! Of course my favourite colour is pink so you can imagine how excited I am everyday having two girls! My pet hate is people who have a lack of commonsense and it really annoys me when people don’t put things back where it belongs!! I love socialising and have a wonderful group of friends who I adore and appreciate everyday! My mum is my bestfriend, my sisters come a close second and my dad is my hero! A part from my husband and kids, I could not live without my parents and my sisters and their husbands and kids! Speaking of kids I also have 3 nephews and a niece who are like my children as well and I am very lucky to still have two grandmothers and a grandfather! I have been thrown a few curve balls in life! We have lost some close family members at such young ages to cancer. As a mother I have 3 out of 3 children who suffer chronic middle ear infections and have been in and out of hospital getting grommits, adenoids out, a daughter who has allergies and a son who has been extremely difficult. My own health has had issues too. 2 years ago I was diagnosed with a tumour in the right side of my thyroid. After getting half my thyroid removed it was discovered that the tumour was benign (thank God)! I thought that was going to be my biggest health curve ball, but sadly I was mistaken! Last year when I was 37 weeks pregnant with my daughter, I was diagnosed with a heart condition – a dilated aorta! It was the most scariest time of my life being told that I could have died giving birth to my daughter….from that moment on my life has changed forever!!!! I don’t sit here and dwell on the bad things in life, I look at how blessed I am to be able to experience life! I’m not saying that I don’t have the occasional melt down or cry when things go wrong, I wouldn’t be human if I didn’t! I do get sick and tired of going to specialist appointments for me and the kids as I could think of a million wonderful things I would rather do. BUT I believe things happen for a reason and life is about learning. If I didn’t go through all the things that I have been through, I wouldn’t have learnt anything! So that just about sums up me and who I am! From this day on, I intend my blog to be a reflection of learning, in relation to many different aspects of life that we stumble across. I’m hoping my blogging journey will one day help me write a book! Congratulations on your official blog launch!! How exciting! Blogging is so much fun and it’s a great way to reflect on your life, and appreciate all the wonderful things in your life. You have a great positive energy and I look forward to reading more! lol…silly me I just realised you commented about my “About” blog…lol! I thought you were talking about my “Jackpot” blog! Thank you for your support…xoxox! Hi! I’m Sue, and I’m from SlimKicker, a fitness/diet app and online website. I bumped into your blog yesterday and it captured my interest! Having read this I believed it was rather informative. I appreciate you spending some time and energy to put this article together. I once again find myself personally spending a lot of time both reading and leaving comments. But so what, it was still worth it! An impressive share! I’ve just forwarded this onto a colleague who has been doing a little research on this. And he in fact ordered me dinner simply because I discovered it for him… lol. So allow me to reword this…. Thank YOU for the meal!! But yeah, thanx for spending time to discuss this topic here on your web site. this weblog includes awesome and in fact fine material in favor of readers. This often takes about three years for you to overall which together with. certainly like what you are stating and the best way wherein you say it. same niche as yours and my visitors would really benefit from a lot of the information you present here. I think the admin of this web site is genuinely working hard in support of his web site, as here every material is quality based material. Thanks for another great article. Where else may just anyone get that type of information in such a perfect way of writing? superb usability and appearance. I must say you have done a great job with this. These are really great ideas in concerning blogging. You have touched some good points here. Useful information. Lucky me I found your site by chance, and I’m stunned why this coincidence did not happened in advance! Does The Fat Loss Factor Works? excellent. I really like what you have acquired here, really like what you are saying and the way in which you say it. Εveгyone loveѕ what youu guys tend to be up too. This sort of clever woгk and reporting! The clearness on your put up is simply excellent and i can suppose you’re knowledgeable on this subject. blog and would love to find out where you got this from or just what the theme is called. We absolutely love your blog and find nearly all of your post’s to be what precisely I’m looking for. Would you offer guest writers to write content for you? I wouldn’t mind publishing a post or elaborating on a few of the subjects you write concerning here. Again, awesome site! Haave you ever considered creating an ebook or guest authoring on other blogs? and would resally like to have you share some stories/information. I know my readers would value yoiur work. I haven’t done that sort if thing yet but am interested in starting in the new year! This content is very entertaining but I see that you are not using the full earning potential of your blog.